1.Band Size: 38mm & 40mm fits 130-180mm wrists, 42mm & 44mm fits 150-200mm wrists. 3.Milanese Loop Colors: Black, Colorful, Gold, Lavender, Silver, Space Gray, Rose Gold. Watch Case Colors: Black, Clear, Gold, Rose Pink, Silver. 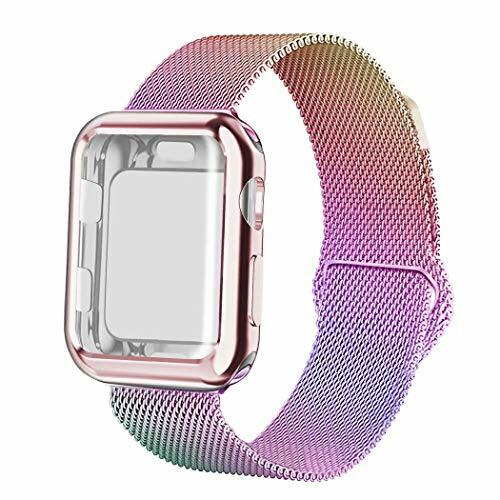 [Unique Design]: The bands for apple watch are made of fashionable & durable woven mesh stainless steel with magnetic. [Strong Magnet]: Adjustable strong magnet clasp design of the milanese wristband, no buckle needed, easily stick and lock your watch band. [Apple Watch Case]: It protects the watch from scratch and collision. And it could protect 5 faces of the watch. [Compatible Models]: The Milanese Sport Band with the apple watch case compatible with iWatch Series 4/3/2/1. [What you get & Warranty]: Milanese Sport Loop band x 1 + Free Watch Case x 1. 12 month Lifetime Warranty, within 24 hours quick-reply and lifetime friendly customer service.